Today is my turn on the Oakshott Lipari blog hop, which is being hosted by Lynne and runs for the month of May and showcases Oakshott's Lipari collection. 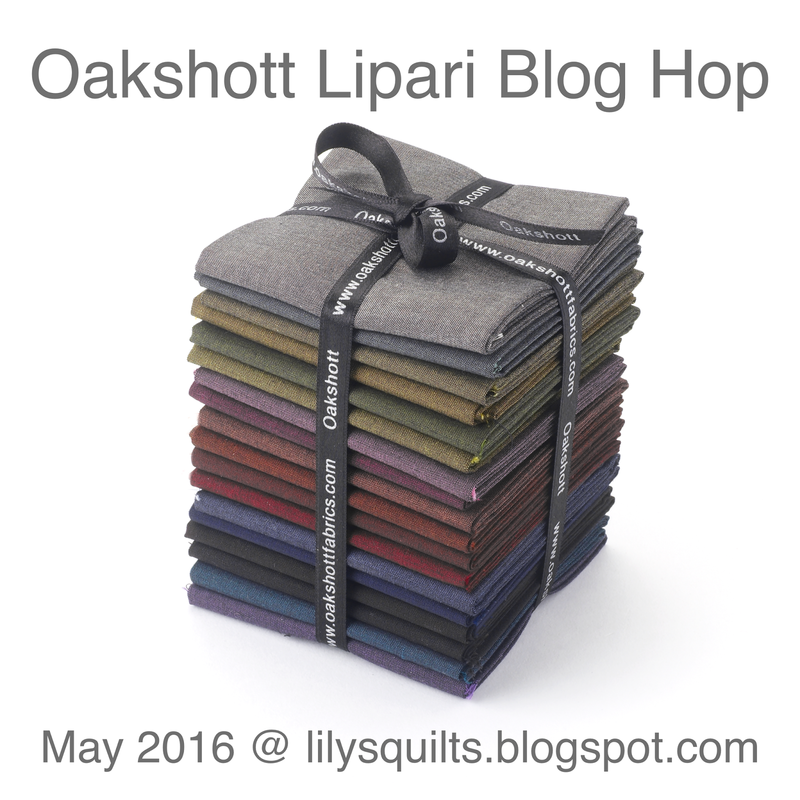 I've made no secret of the fact that I'm a huge fan of Oakshott's fabrics - they're beautiful to look at, as well as being lovely to sew and I'm honoured to be part of this blog hop. Thank you, Lynne and Michael, for inviting me to take part and trusting me with the fabric! Oakshott's Lipari collection contains eighteen colours, and each of the colours has a black warp and a different coloured weft which results in luxurious colours that shimmer and shine. The fabrics subtly change shade depending on the light and this gives projects a really special look that you just don't get with other fabrics. Also, the fabrics are 54" wide so you get a lot more than you'd expect in a fat eighth bundle, which is always good! You can find out more about the inspiration for this collection here. Can you see why I haven't managed to quilt and bind it?!! 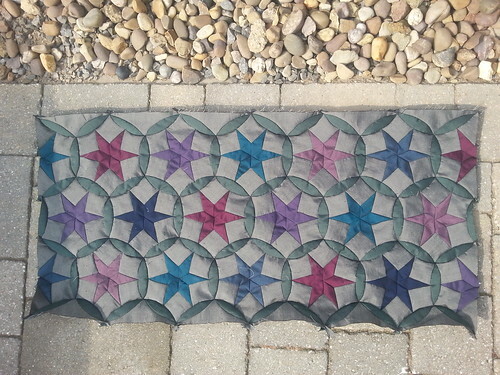 I can't quite believe I've managed to finish it (you wouldn't believe how much hand piecing I've done over the last three days to get it pieced on time!) and I'll admit that I'm rather pleased with how it's turned out! It measures around 37" x 17.5" and is (yet another) table runner for my new coffee table, but could easily be made longer for a dining table. 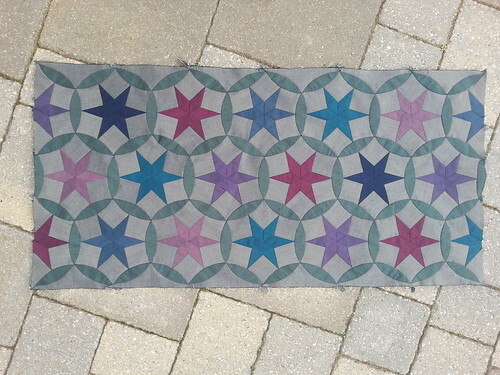 I found the block in 5500 Quilt Block Designs by Maggie Malone (ISBN 4972507749), where it's called 'A Pretty Patchwork'. There isn't a reference for when it was first called by this name or who first designed it, so I'm assuming it's one of those 'been around for as long as anyone can remember' blocks like the churn dash or nine patch. I don't tend to name my projects (other than calling them what they are: the hexy quilt, the blue and white quilt, that one I made for Nanna, etc. ), but at the moment I'm calling this 'Pretty Little Thing' (aka 'What On Earth Was I Thinking?' or 'I Must Not Have Been In My Right Mind') which makes me think of the Queen song. 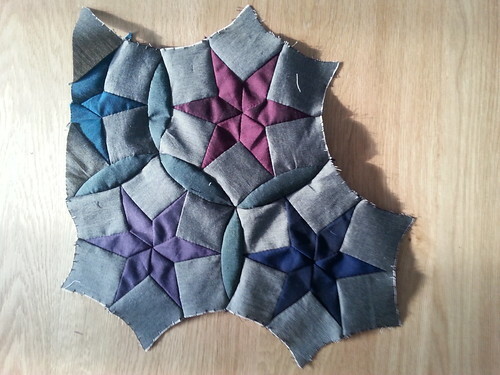 I'm not going to do a step-by-step tutorial for this project as most of it is fairly straightforward piecing (albeit a little time consuming!) but I will share some progress photos which show my stitching sequences and some tips to make things a little easier, as well as some general hand piecing tips. Let's get on with it, shall we? * Please be aware that you may need a bit more than this, depending on how you arrange your template pieces on the fabric, but these two colours are in the fat eighth bundle so you have a little extra to play with if needed! 21 B pieces in each of the following colours: Lipari (dark pink), Marina (teal), and Gallina (purple). 15 B pieces in Scari (mid blue). 12 B pieces in Volcano bleu (dark blue). 18 B pieces in Canneto (mid pink). 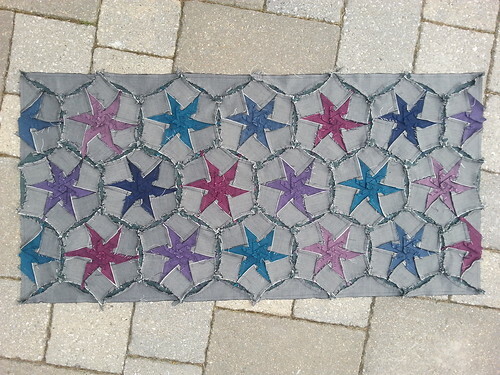 104 C pieces in Pollara (grey - background for the stars) and 8 'half C' pieces (edge pieces for the half stars) - cut template C along the red dotted line to make a half C piece. 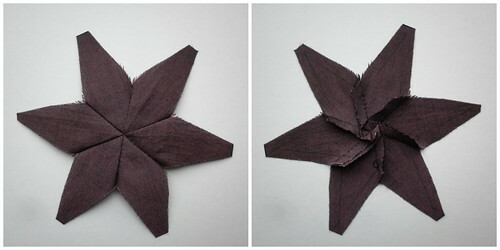 You will need both halves of the C template for each half star as it needs two mirror pieces to make it correctly. 65 A pieces in Salina (green) and two 'half A' pieces. 12 E pieces in Pollara. I print my templates onto freezer paper and then iron them to the reverse of the fabric (although there's no reverse side for Oakshott because it's woven), draw round them with a fine pencil and then cut out approximately 0.25" from the drawn line. The freezer paper stops the fabric from shifting when drawing round the templates. Use a fine mechanical pencil to draw the sewing lines, and use a ruler to help draw any straight lines. Make sure you haven't got 'fit to page' selected before printing. It doesn't really matter if your 1" test square isn't exactly 1" square, as long as you've printed all your sheets with the same printer using the same settings, and all your pieces are the same on each sheet of templates. Use a strip of paper/card 0.5" wide to help space the templates. Remember to include the match marks when drawing round the templates as these will help enormously when sewing the curved seams. Extend the sewing lines beyond the points of the templates as this helps you see the start/stop point more easily. The E template has very fine points at either end so take extra care when preparing these pieces. When cutting out my pieces, I like to have something on my lap to catch the off-cuts (in this case the lid of my sewing tin, but it's often a cereal bowl) which keeps things a little tidier. Clip the curved seams before you start. I clipped about halfway through the seam allowance (about 1/8") and clipped above the match marks and twice between each match mark. It's a little hard to see (grey pencil on green fabric is quite hard to photograph!) but if you look closely, you will just be able to see the match marks as well as the drawn line going beyond the ends of the template. Three whole stars and one half star in each of Lipari (dark pink), Marina (teal), and Gallina (purple). Two whole stars and one half star in Scari (mid blue). Two whole stars in Volcano bleu (dark blue). Three whole stars in Canneto (mid pink). 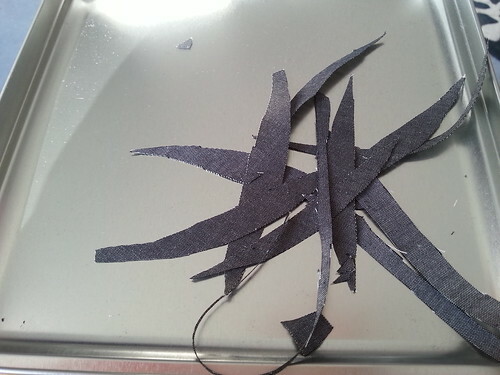 I used black thread to join the star pieces together (the colours) and then mid-grey thread to join in the background (grey) pieces. 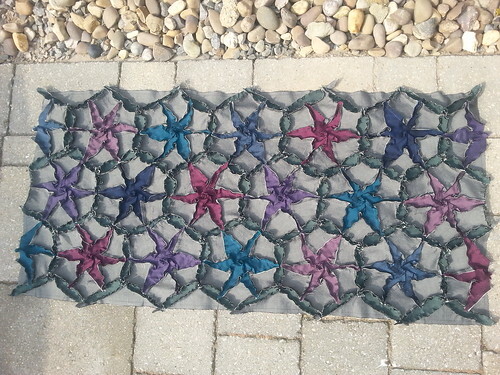 Use as much continuous stitching as possible to avoid starting and stopping unless necessary. 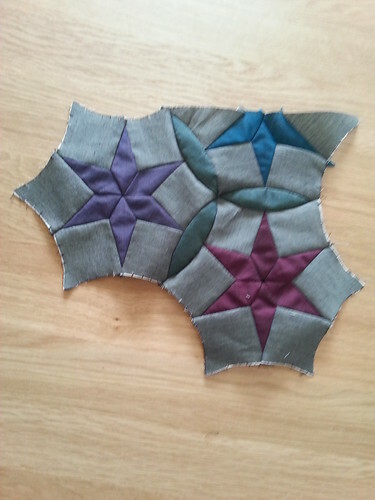 I stitched the first pair of star points together from the outside in, and then stitched the next piece onto that pair from the centre out (i.e. without breaking the thread). 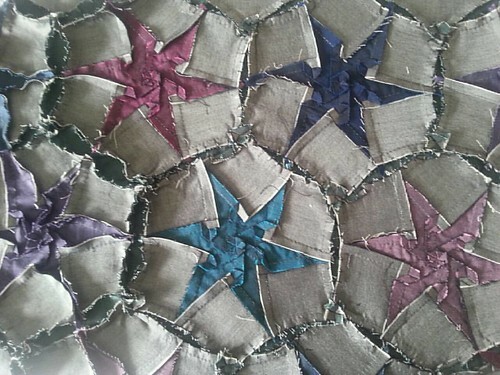 I continued round the star until I'd joined all six pieces together. 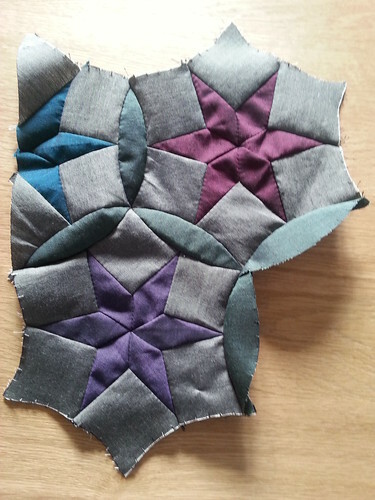 Circle the intersection when piecing in the final piece. This helps close up any small hole in the centre and draws the points together. When piecing in the background pieces, sew from the background piece side as it's a little easier to see the sewing lines. Use mid-grey thread so it doesn't show through. If you don't have an exact match then it's better to go for thread a shade darker rather than a shade lighter because slightly-too-light thread will show up far more than slightly-too-dark thread. 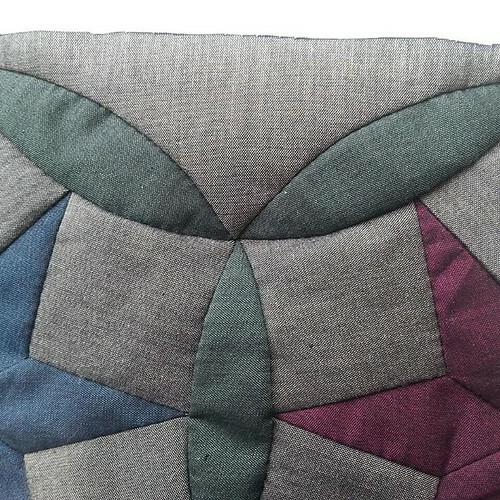 Stitch from the star side of the seam - it's easier! Pin, pin and pin some more! I put a pin through each match mark as well as the beginning and end of each seam and often put a pin between as well. You may find it easier to just pin one section (i.e. 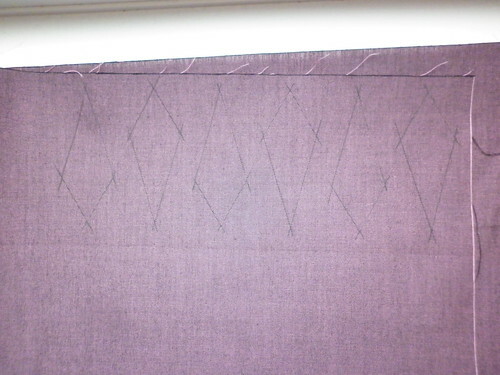 the space between match marks) at a time and then stitch that before moving to the next section. Use whichever stitching sequence you find easiest, which won't necessarily be the same as mine. Don't despair! It can be easy to get a bit lost with where you are, which is why I worked along the first two rows, joining first one star to the top row and then one star to the middle row. 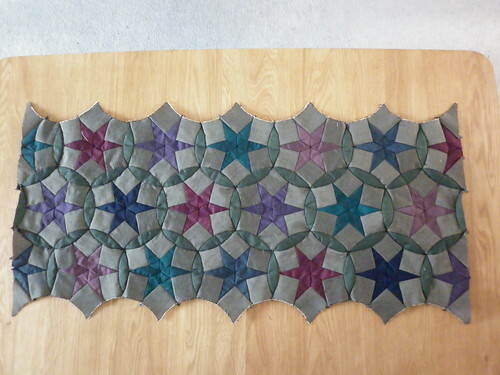 When joining on the bottom row stars, I attached three segments before attaching a star. 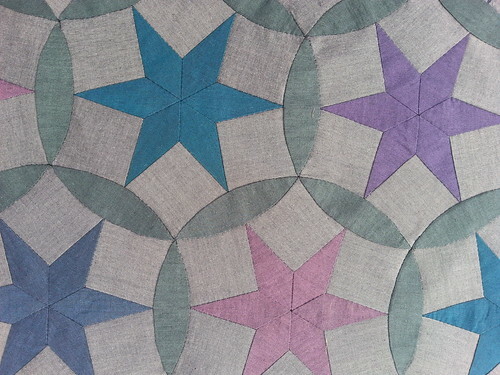 Once you've joined all the stars and half stars (as well as the two half segments needed at either end of the middle row), you need to join in the E pieces to make the top and bottom edges straight. 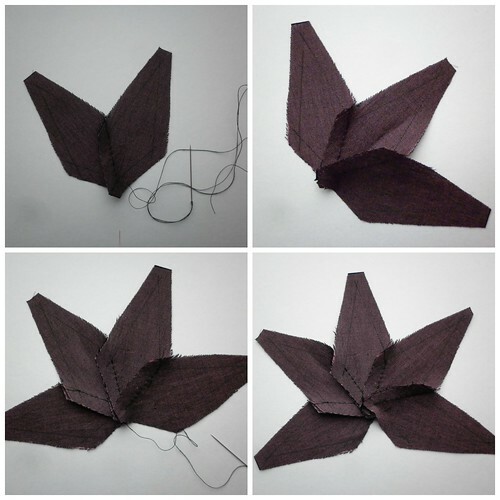 Template E has very sharp points and it can be tricky to prepare the pieces accurately. You may find that you need to slightly alter your sewing line (or where the beginning/end of the sewing line is) when joining to the segments. 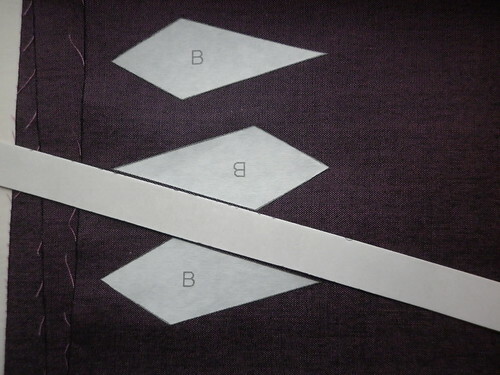 Pin the match marks and the obvious seam start/end first and then use the intersection on the segment pieces as your guide for the start/end point of the curved seam. Stitch from the grey side. Even though the end point can be harder to spot on this side, the rest of the stitching is easier from this side. I joined two segments to each edge piece (to make a piece resembling Mr Potato Head's moustache) before then joining this piece to the rest of the table runner. It was much easier and quicker this way. 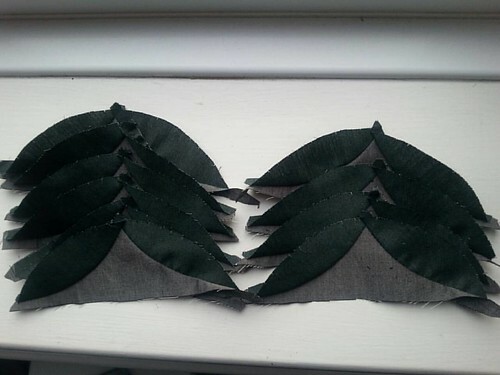 I found that, contrary to experience and received wisdom, I got a better result when joining the 'moustache' to the runner if I started each seam with a new piece of thread rather than doing continuous stitching all the way along each side. Remember to circle the intersection where three segments meet to get a neat finish. 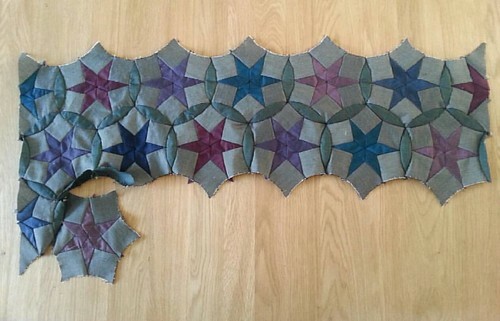 Once all the pieces are joined together, take a few moments to lay it out and admire your stitching. This step is important because the next step (pressing the seams) can be a little soul destroying and you need an image of the finished item in your head to spur you on! It's a s*d of a job, just keep going! A little bit of steam helps, but only a little bit or you'll end up distorting those bias seams! I had my iron on the second lowest steam setting (there are six), and at the start of the cotton (three dots) heat setting. 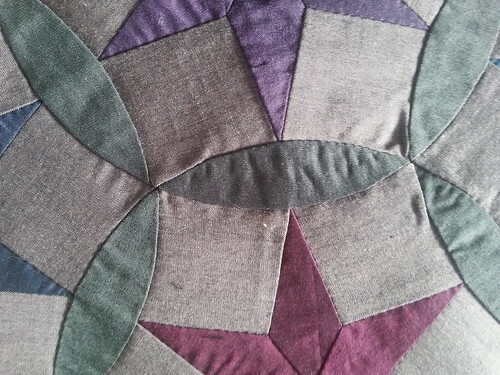 Where possible, it's easier if you can press the star seams in place first before tackling the segment seams. 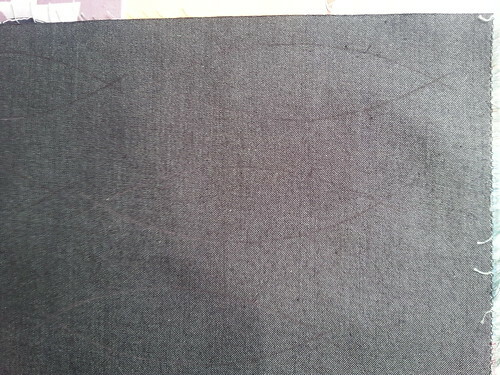 I pressed all the segment seams towards the centre of the segment. As far as possible, swirl the seam intersections to reduce bulk. The clipped seams help you to squash the seams under each other. Once you've pressed all the seams as best you can, turn it over (right side up) and inspect all the seams to see which need a bit more attention. Turn it back over and tackle each one, it's usually that part of the seam close to where three segments meet is turned back on itself. Once all the seams are as good as you can get them, turn it right side up again and give it a good press (with a little bit more steam) to give a crisp finish. A little (and I mean a little!) judicious 'squashing' with the iron can work wonders with any stubborn segment intersections! Pressing the seams - those on the right have been pressed into submission, those on the left are yet to be tackled. If you make this project, I'd love to see it! You could email me a photo (archiethewonderdogblog at gmail dot com), contact me on Twitter (@Archiewonderdog) or on Instagram (also @Archiewonderdog) and use #prettylittlethingblock so I find it! Good luck!! Now, if you'll excuse me, I have some plants to plant and some housework to do. I think I'll have a little lie down first, though! P.S. 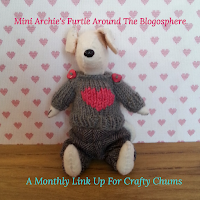 You didn't think I'd blog without a photo of Archie, did you?! 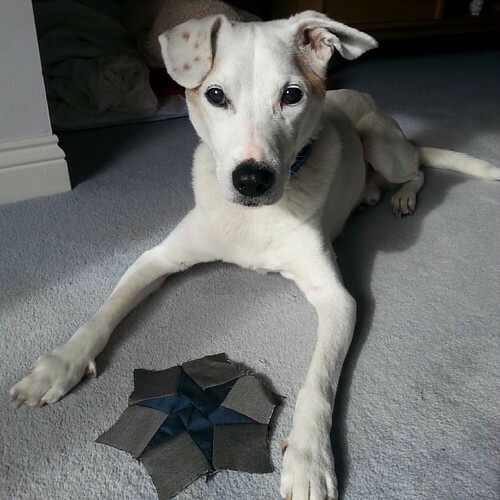 I quite like this star, is it for me?